Destiny 2 has finally, officially been revealed following an excellent teaser trailer earlier this week. In today's reveal trailer Cayde-6 returns alongside Commander Zavala to give us some helpful background on the sequel's premise. Once again, Nathan Fillion is a national treasure, breathing life into Destiny's most lifelike character. In contrast to Zavala's rousing speech, Cayde-6 is even funnier. I'm very happy that Bungie is focusing so heavily on story this early on, even though it's a shame we haven't seen any gameplay yet. Still, this focus on story is a good sign for those of us who found the original game's lackluster, jumbled single-player campaign a huge letdown. This time around the Last City has been burned to the ground by the Cabal led by a mysterious evil alien named Ghaul. (Cayde-6 humorously mangles his name in the trailer.) We know little of Ghaul other than he's obviously a pretty smart strategist if he can level the Tower and scatter humanity across the solar system. So the new enemy is the Red Legion, and your job is to reunite humanity and fight back. Pretty cool. The reveal trailer gives us a narrative answer for why loot won't transfer from the original game to Destiny 2. They actually show all your guns getting destroyed in the attack by the Red Legion. This is great. I've argued in the past that loot and progression shouldn't transfer to the sequel. The very point of a game like this is to level up and find gear. If you already have a high level and lots of gear, well, it kind of defeats the point! Bungie had already revealed that loot wouldn't transfer over---only your character, none of their stuff will make the leap---but it's nice to see this explained in the game's fiction. Ghaul took everything from you, now it's time to take it back. 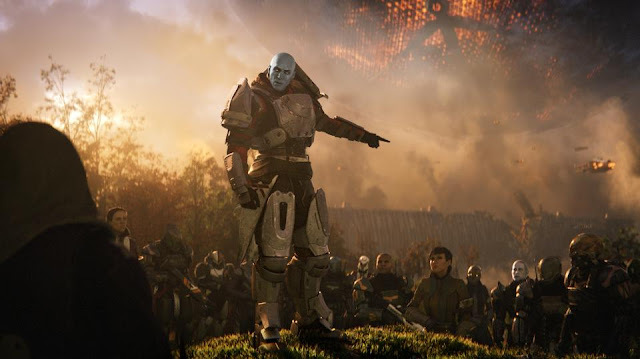 In the trailer, Cayde's uninspiring speech about how everyone might very well die is only met with cheers when he calls out, "Also, there will be a ton of loot!" So yeah, expect tons of loot, obviously. We may not have seen any gameplay today, but Bungie has a gameplay reveal already scheduled. Gamers will get a taste of the game in action on May 18th. The reveal will be a livestream rather than a trailer so expect to see something pretty meaty. The only downside is that May 18th is over six weeks away! There will be a Destiny 2 beta this summer. It opens up to anyone who pre-orders first, but will be followed by an open-beta for all-comers. Betas are the new demo, and this is hardly surprising given the success of the original game's beta. According to the pre-order page, the Expansion Pass gives you "access to both Expansion I and Expansion II, offering brand new story missions, cooperative activities, competitive multiplayer, and a wealth of new weapons, armor, and gear." The Limited Edition which comes with all of that plus a Steelbook case, a Cabal-themed Collector's Box which includes various goodies. And finally, the Collector's Edition which includes everything from the rest of the editions plus a Frontier Bag, 15" laptop sleeve, Solar panel USB charger, paracord, and a solar blanket. I like it. I mean, it's pretty safe and pretty standard but it gets the game's point across. It could be a hell of a lot worse! Destiny 2 launches on September 8th, which is less than half a year away! As previously rumored, the game will be coming out on Xbox One, PlayStation 4 and PC. Hooray! I've said in the past that this is the best decision Bungie could make, and lo and behold they've done it! I've written about this already, but Sony is once again getting timed exclusive content for PlayStation 4 owners. I still think that's a mistake (and I apply that to all cross-platform games with exclusivity deals, whether it's Xbox or PS4) but it is what it is. That's all we know so far about Destiny 2. It's still a ways off, and more details about the game will continue to trickle in. So far I'm impressed with the focus on story and the sequel's premise. Starting from scratch, hunted by the Cabal, seeking to reunite a fragmented humanity, all of this sounds like a great way to usher in the new game. Stay tuned for more Destiny 2 coverage here at Forbes Games. †Beta platform availability and launch date(s) TBD. See destinythegame.com/beta for details. Limited time only, while beta codes last, at participating retailers. Internet connection required. May require subscription for applicable platform, sold separately. Minimum 68 GB available hard drive storage space required as of September 2017. Storage requirements subject to increase. After September 2017, see www.destinythegame.com/size-requirements for current requirements prior to purchase. May require additional storage for set-up, features and updates, including to download mandatory in-game updates to continue playing. Users responsible for fees for broadband internet, which is required. Additional charges may apply for online content and features. Significant elements and functionality may require subscription for applicable platform, sold separately. Activision may modify or discontinue online services without notice at any time. Destiny 2’s first narrative trailer didn’t show any of the actual gameplay — that’s coming in May — but it did provide a narrative-based excuse for the game to remove your gear from the first game, even though you’ll be able to carry over your character. But you’ll lose “power, possessions, and Eververse-related items and currency.” Sorry about all those guns you worked so heard to earn. They’re gone. The trailer introduces Destiny 2’s villain, a character named Ghaul who leads an army called the Red Legion. They attacked the Tower and, despite the best efforts from the Guardians, destroyed it. The trailer is even nice enough to show you all your great gear being lost to the ages. “So. Everything is gone. Your stuff. My stuff. Most importantly, my stuff,” Cayde-6 helpfully explains. So your character from the first game survived the events that lead up to the second game, but they also conveniently took all their gear off and dropped every gun while doing so, and also everything in storage is gone. Yay! So it’s fun that the company basically called out the loss of your stuff in the trailer with a joke, but longtime fans of the first game are still likely to be a bit annoyed at losing their equipment. But at least now Bungie can start everyone off on level footing in terms of weapons and armor. Maybe that sense of anguish will just add to the game’s sense of desperation as you struggle against overwhelming enemies? Or maybe not. Destiny 2’s out on PlayStation 4, Windows PC and Xbox One on Sept. 8. 0 Response to "Everything You Need To Know About The 'Destiny 2' Reveal"